Dr. Seree Nonthasoot, the Representative of Thailand to the ASEAN Intergovernmental Commission on Human Rights (AICHR), attended the 2013 Raphael Lemkin Seminar, Global Edition. Acts of genocide and mass atrocity led to the establishment of the United Nations and the UN Genocide Convention. This convention is one of the first humanitarian and human rights instruments—its adoption predates that of the Universal Declaration of Human Rights. As the Representative of Thailand to the ASEAN Intergovernmental Commission on Human Rights (AICHR), my mandate covers the promotion and protection of human rights in the ASEAN region and regional human rights issues that involve Thailand. While many people often associate genocide and mass atrocities with other parts of the world, most pertinently Europe and Africa, the Southeast Asian region is not immune to genocide, atrocity and large-scale violence. The imminent economic and closer social integration through the ASEAN Community may pose greater risks of genocide and violence. On a positive note, the integration process will serve as a platform through which the history and experiences of genocide can be shared at the regional level. That is why I am committed to advocate for genocide and mass atrocity prevention. My interest and agenda on genocide and mass atrocity prevention have been significantly informed by the Lemkin Seminar that I took part in 2013. I think it is necessary that we regularize our message on the issue, and in this regard, I am much heartened by the statement made by the Cambodian Prime Minister at the Conference on Responsibility to Protect at 10 in Phnom Penh in early 2015 that his government intended to create a training center on genocide prevention in the capital city. I am fully supportive of this initiative and think that it should be amplified and supported by other ASEAN Member States too. What actions and policies do you feel are most effective in the long-term prevention of atrocity in Southeast Asia? In my view, effective atrocity prevention can only be achieved through a holistic approach underpinned by legislative, policy and awareness-raising endeavors. On the legal framework, commitment by States to prevent atrocity can be manifested and buttressed by ratification of the relevant international instruments, most notably the Genocide Convention and the Rome Statute. ASEAN has a long way to go on this issue since the two instruments have not received full regional ratification and, unlike our neighbouring countries, Thailand has not ratified any. On the policy level, it is crucial for governments to carry out capacity-building programs to foster preparedness and effectiveness on implementation of the pertinent international obligations. A thorny topic that is often cited as a hurdle to ratification is the existing laws or practices that may be incompatible with the prospective instruments. States should therefore conduct an examination into these laws and practices and implement reform measures that amend or repeal them. Generally, with or without ratification, governments can certainly implement awareness-raising programs to enhance understanding of the public and stakeholders on the importance of the issues. The goal is to mainstream the basic concepts of the causes and prevention of genocide and atrocities. 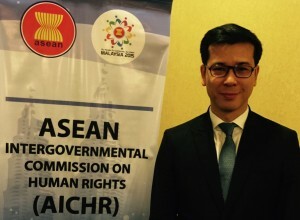 As the focal human rights institution for ASEAN, the AICHR has an important role to play. Besides encouraging ASEAN Member States to ratify more international human rights instruments, the AICHR can address subject matters that have regional human rights implications, including atrocity prevention. As representative to AICHR, what does a typical day in your job look like? Like the other nine AICHR representatives, I am also in charge of other positions. Apart from being an AICHR representative, I am a Senior Executive Vice President of the Institute for Research and Development for Public Enterprises where I supervise training and research programs that are aimed at enhancing efficiency and governance of public enterprises. The AICHR work primarily entails preparing for and attending meetings held at regular intervals—there were seven meetings in 2014. In addition, each AICHR representative also takes initiatives to organize activities on behalf of the AICHR in his or her own country. For example, Thailand has played a strong role in conducting workshops pertaining to institution-building agendas and human rights trainings for various groups of public officials and this year we will organize a human rights training for journalists from all ASEAN countries. We have already planned to undertake a thematic study on legal aid in ASEAN in 2016. It is fair to say that nearly every month of the year there will be AICHR meetings or activities or both, which require the representatives to travel to different ASEAN destinations. Moreover, I always make myself available to engage with public and private agencies both in Thailand and abroad that seek better understanding of the human rights mechanisms in ASEAN or to exchange experiences on human rights promotion and protection. I consider these different positions complementary to one another as they help broaden my perspectives and keep abreast of the situation in various areas. 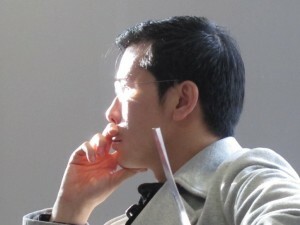 Thus, in a typical day of work, I alternate between preparing for AICHR meetings, planning for the next AICHR activity in Thailand, managing training and research programs for public enterprises and readying myself to participate in seminars and workshops in various venues. There is definitely a lot to learn if one cares about promotion and protection of human rights in general and genocide prevention in particular. For those officials who are already involved in the field, my suggestion is to be open-minded and do not take for granted other issues that are relevant to genocide, such as economic and social disparity, exclusion and discrimination. The understanding of their interconnectedness is a key to successful policy formulation and implementation on genocide prevention. Government mandate is characterized by its systematic routine and highly specialized focus and while it cultivates expertise, it can lead to a silo mindset that neglects the severity and importance of atrocity prevention. It goes without saying that governments must “institutionalize” awareness-raising policy and programs so that atrocity prevention and other human rights associated information become streamlined into all public agencies. 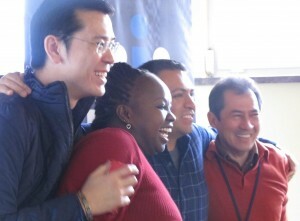 There are a number of people who inspire me and in terms of human rights. The first two that come to mind are Professor Raphael Lemkin and Dr. Puey Ungpakorn. Prof. Lemkin is widely recognized for his coinage of the term “genocide” and indefatigable campaign on genocide prevention, while Dr. Puey Ungpakorn is a former Rector of Thammasat University—my alma mater—who pioneered the social volunteer program with a view to instilling a volunteer spirit among the university students and enhancing the livelihood of the people in the rural areas. His 1973 article, “The Quality of Life of a South East Asian: A Chronicle of Hope from Womb to Tomb,” has also led to a novel approach on economic and social rights and a welfare system that is in use today in Thailand. We are celebrating the centennial anniversary of his birth this year. In my position, I am deeply motivated by the prospect of regional integration in ASEAN, which will come into effect on December 31, 2015. I am hopeful that this integration, especially through the ASEAN Economic Community, will bring about greater prosperity and better social and economic opportunity for the ASEAN peoples. At the same time, I remain cautious of the negative impacts that will result from this process. The major areas of concern are migration and environment. A massive intraregional flow of the people, especially migrant workers, will make them susceptible to abuses of human rights and fundamental freedoms and will provide a fertile ground for discrimination and possible mass atrocity vis-à-vis the migrants. Environmental degradation and dispute can also trigger international conflicts and violence. Thus, it is imperative that ASEAN governments collectively address the issue and adopt preventive measures. Prevention of genocide, atrocity and large-scale violence must be a priority for ASEAN as a whole.